offers services 24-hours each day / 365 days a year. Computer use can be monitored. It is impossible to completely clear the “footprints” showing where each patron has been. If you are in danger, exit our website immediately and return to our site from a safer computer (a computer in a safe location where someone abusive does not have direct or remote access). 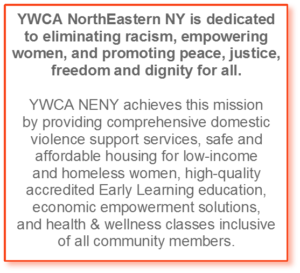 You can call the YWCA at (518) 374-3386 or call the National Domestic Violence Hotline at (800) 799-SAFE (7233). If you are in immediate danger call 911. If you are not in danger, and you would like more information about browsing safely and privately, please click HERE. The Domestic Violence Program offers safe shelter, counseling, advocacy, groups, case management, children’s services and post-shelter services to victims of domestic violence. Persons coming into our domestic violence service via shelter, counseling, advocacy or support groups must be able to care physically for themselves and not need supervision in the care of their children. Our Domestic Violence shelter is wheelchair accessible. The YWCA building is not wheelchair accessible, however, it is negotiable if a person uses a walker or cane. We do not accept victims or children of severe emotional impairment, which would impact group living or negatively affect group counseling. Appropriate services to meet their needs would be made through referral. The Mary Kay Foundation helps support our shelter. The Mary Kay Foundation, along with YWCA NorthEastern NY, strive to make a difference in the lives of individuals and families who face despair on a regular basis. To find out more about the Mary Kay Foundation, please click here. Free, confidential and supportive counseling for victims (16 years and older) who are abused and their children (5 years and up). We use a Trauma Informed Client Centered approach to counseling. Services are available to anyone who has ever been a victim, whether recently or many years ago. Flexible hours available. Call 518-374-3394 ext 142. For more information about the Counseling Services available, click HERE. YES is designed to assist women who are victims of domestic violence manage their personal finances, identify their interests and skills, and find employment. As a part of the department, women will be assisted with financial planning, time management, and goal setting. Preparation for job interviews and providing professional clothing will help job seekers make a positive first impression. For more information contact Andrea at 518 374-3394 ext 144.